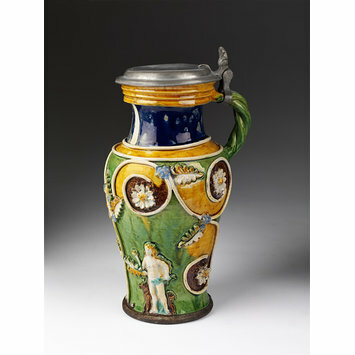 Lead-glazed earthenware with applied or 'sprigged' decoration was made in several pottery-making centres in Bavaria and Austria in the 1500s. 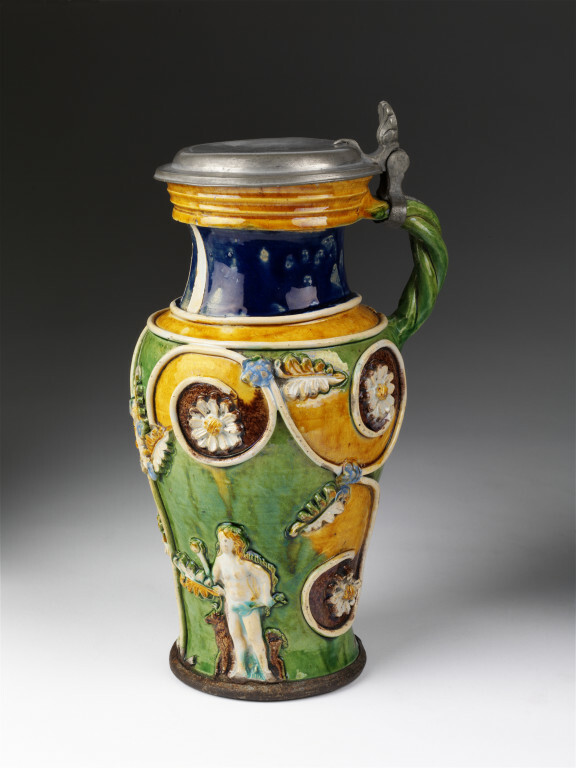 The Preuning family of potters based in Nuremburg is recorded as making high class pottery of this type, although there are no marked pieces known, and there are also other workshops associated with these wares. Jug in lead-glazed earthenware of tapering baluster shape, applied with a twisted handle and a hinged pewter cover, the base and foot rim also in pewter, the body applied with sprigs depicting Adam and Eve, standing flanking the Tree of Knowledge with stylised scrolling branches, leaves and flowers, Adam holds an apple and has a lion by his side, Eve also with an apple, she has a stag besides her, the applied decoration is picked out in ochre, blue, white and brown glazes on the predominantly green-glazed ground. Lead glaze earthenware decorated with coloured glazes and relief figures depicting Adam and Eve and the Tree of Knowledge; with pewter lid. Probably made by Paul Preuning. Germany, Nuremberg, about 1550.